Now in its fortieth year, the San Jose Museum of Quilts & Textiles is at a juncture in time, where we can both reflect on the past and look forward to the future. A juncture can also be an intersection of place or events, often one laden with symbolic potential: In many folk traditions, junctures as represented by crossroads are a potent metaphor for transition. Though a juncture can be a time for reflection, the word can also describe a critical moment or crisis that demands immediate action. With the concept as their point of departure, artists may take the exhibitions theme for "juncture" where it leads them. Inserting one's identity is inherent in the process of an artist and their body of work. As San Jose Museum of Quilts & Textiles celebrates its 40th year, we reflect on our own identity and highlight pieces from the permanent collection acquired in the last five years. Through a variety of mediums, artist Mary Corey March explores questions of individuality, humanity, data, and expression. March’s participatory installation Identity Tapestry will enlist SJMQT visitors in creating a portrait of our community. Participants choose a ball of yarn to trace along the framework of statements pinned to the wall. These statements begin with basic biographical information, such as “I am a woman,” but splinter off into more complex facets of identity: “I have seen someone dying,” “I stop to enjoy a beautiful moment,” “I am fortunate.” Connecting point to point with their yarn, participants trace out the paths of their identities, making visible the ways in which we are the same and different from one another. In each of its locations, including San Francisco, Pepperdine University, Southern Vermont College, and Pfäffikon, Switzerland, Identity Tapestry thus becomes a work of art as unique as the people who contribute to it. The 13th Quilt Nihon Exhibition features over 30 quilts from the Japan Handicraft Instructors’ Association (JHIA), an organization that has promoted handcraft arts through training and publications in Japan for over 45 years. On display are quilts made by some of the most talented and respected artists from Japan and the Pacific Rim. SJMQT is pleased to be the first museum in the U.S. to present the 13th Quilt Nihon Exhibition, and these extraordinary prize winning quilts. Artist Sabine Reckewell creates large-scale installation art using materials which resemble a line drawing in space. Reckewell's site- specific installation will span over 18 feet of orange polyester webbing to create an illusion of linear interventions. On view will be a selection of modern and historic quilts from the museum’s permanent collection, many from a recent gift and never before displayed. Traditional techniques get contemporary interpretations as Bay Area Basket Makers (BABM) artists transform a variety of natural materials, found objects, wire, and uncommon fibers into vessels, baskets and sculptural forms. THANK YOU TO THOSE THAT HAVE SUBMITTED THEIR FIBERSHOT PIECE! Carissa Carman, Ellie Honl, Anne Luben and Emily Weihing work across Textile and printmaking processes incorporating stitched paper, mono-printing, cyano-type, marbling, and screen-printing. This dynamic group of works explore ideas of place and personal narrative and push the boundaries of what a quilt is through variations in surface, form and imagery. Modern quilters work in different styles and define modern quilting in different ways, but several characteristics often appear which may help identify a modern quilt. 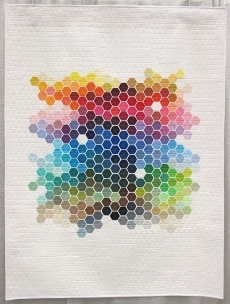 These include, but are not limited to: the use of bold colors and prints, high contrast and graphic areas of solid color, improvisational piecing, minimalism, expansive negative space, and alternate grid work. The Modern Quilt Guild was founded in 2009 and will show an array of contemporary quilts in this two - gallery show. Northern Californian has a long history of protest and political involvement. For Linda Gass, Gyongy Laky and Linda MacDonald the passion they bring to political issues is reflected in their artwork and the paths their lives have followed. This exhibit was curated by Barbara Shapiro, who also wrote the essay that inspired the exhibit. Read it here. This exhibition tells the story of a Japanese teacher, Junko Yoshikawa who came to the island of Caohagan to teach quilt-making techniques. A small island in the Philippines of just 600 residents, the quilts are uniquely inspired by their tropical climate and marked by their expert handiwork. Today quilting has become an integral part of the island’s economy making the island sustainable. Lively Island by Genovivia "Novie" Gudia, 2007, 85 x 60"
QUILTBEAST is an art quilt chimera, showcasing the distinct signature styles of three internationally renowned California fiber art Masters, Phyllis Binkley, Marion Coleman, and Allyson Allen. 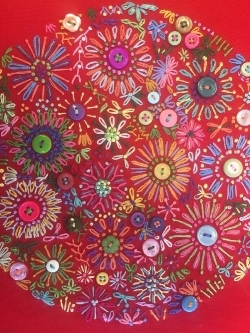 The exhibit features a variety of textile art techniques including graphic portraits, exquisite thread painted landscapes, and dimensionally embellished pieces. *Curated by exhibiting artist Allyson Allen. Sponsored by Glynn & Jo-An Turman and the XI Winds Ranch Foundation. 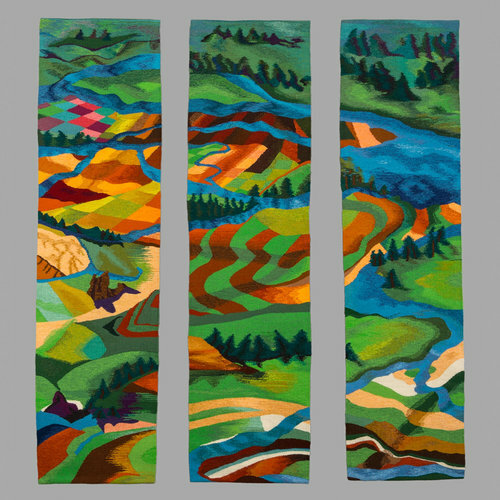 Wool, cotton warp, spaced dyed wool, Tapestry, 72" x 54.5"
Three contemporary mid-career tapestry artists continue to develop and refine their unique approaches to the tapestry medium. One can observe specific tapestry techniques where the patterned design is intimately connected with the technical process. Read more about Corsini, Friedman, and Rohde. 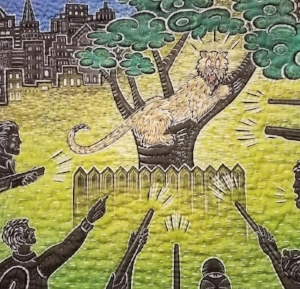 American Tapestry Biennial includes 36 tapestries, featuring artists from eight countries. The works selected for the exhibition high light the variety of artistic expression practiced today in the medium of hand woven tapestry. The pieces range from the subtle, visually complex, and even break new grounds in shape and surface texture. Tapestry's rich history and it's unique ability to render images in the tactile medium of the cloth offer contemporary artists a powerful vehicle for expressing both aesthetic and conceptual concerns. Cerebral Touch: Lia Cook 1980- Now traces Cook's artistic journey from her abstract and dimensional pieces of the 1980s; weaving inspired by Old Masters drapery from her work during the 1990s; exploration of portraiture; and finally, work completed weeks before this exhibition opens. Her latest works explore the sensuality of the woven image and the emotional connections to memories of touch and cloth. Weaving is combined with painting, photography, video and digital technology. Importantly, is Cook’s work and exploration of the possibilities of the Jacquard Loom. In recent years, Cook has worked with neuroscientists to investigate the nature of the emotional response to woven faces by mapping these responses in the brain. Cook’s explorations, layers of meaning, and complexity in thought and design in her work, distinguish her as a world-renowned, groundbreaking artist. Read more here and watch a video here. Line Dufour's project Fate Destiny and Self Determination is a collaborative tapestry project based in weaving and other fiber art methods propelled by social media. The project is a large web of small weavings that people all over the world have donated. Through her Facebook page, she has received submissions from 230 people from 22 countries, a true collaborative effort. Visitors will have the opportunity to make a small tapestry and contribute a small shape to this project. Read more here. Woven in tapestry and depicted in abstraction and realism the classic elements—earth, air, fire and water—represent both a microcosmic and macrocosmic view of the world. This exhibition examines the interconnected and powerful force of these core elements that are essence to life. Eighteen tapestries by members of Tapestry Weavers West range from lyrical landscapes and metaphorical abstractions, to psychological interpretations of these primal components. Founded in 1985 Tapestry Weavers West is a Northern CA based group that promotes the art of contemporary tapestry by exhibiting members work and with its quarterly newsletters, meetings, and website. The Art Cloth Network is a group of professional artists who promote the medium of cloth as an art form. The cloth is a surface transformed. Color, line, shape, texture, value, or fiber is added or subtracted to create a compelling composition for deeply personal storytelling and life reflections. Limitless opportunities are explored: dyeing, painting, foiling, folding, photo manipulating, stitching, and layering. From afar, they are riveting abstract works. Up close the methods used are extraordinary in their diversity and experimentation. 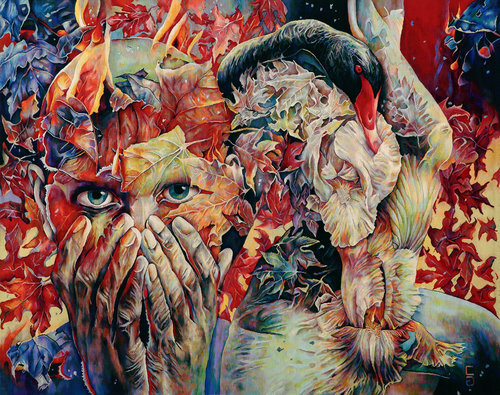 Emotions are worked out through holes burned into flannel, creative cutting and stitching, photo manipulation and layering, dyed fragments, and paint re-touching. Chronicling the lives of the Hmong people of Laos, Story Cloths are vibrant and intricate needlework that developed out of refugee camps following the Vietnam War. As an alternative to written language, village women would stitch cloth at night to document and communicate the story of their daily lives: collecting water, harvesting, transforming hemp into fabric- and also the highlights of their lives: escaping a great flood, New Year festivities, and marriage rituals. The story cloths offer an intimate view into the cultural legacy and resilience of the Hmong people. Join Author Linda Gerdner on Sunday November 6 at 1pm to 2pm for a lecture, reading and book signing. In the last decades of the 20th century, California quilt makers charted new territory in quilt making, leading the nation in creativity and innovation. During the 1970s and 1980s, California artists were among the first to embrace the quilt medium as their primary means of expression. More traditional quilt makers also expanded horizons, creating original designs based on traditional quilt patterns. This exhibition includes works by pioneers of the art quilt movement such as Jean Ray Laury, Yvonne Porcella, Joan Schulze and Therese May, who pushed the boundaries of what could be called a quilt, and highlights late 20th and 21st century artists working in the quilt medium. Clear Palisades, 1987 Linda MacDonald 92x92"